Sivoia QS Triathlon WIDR shades can be incorporated into connected-home systems, run on ordinary D-cell batteries. 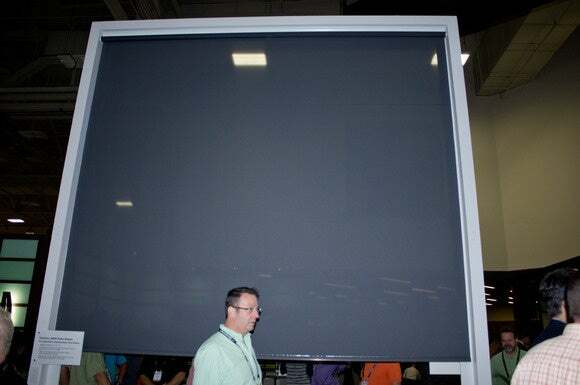 CEDIA 2015, Dallas, TX —If you’re fortunate enough to have very large windows in your home, Lutron’s new line of motorized roller shades can cover them. Sivoia QS Triathlon WIDR roller shades are available in sizes as large as 12 feet wide by 12 feet tall. Integrate them into a connected-home system, such as Lutron’s Caseta DIY product or its dealer-installed RadioRA 2 or HomeWorks QS lighting systems, and you can open or close them with the touch of a button or integrate them into “scenes,” so they close the moment you turn on your TV and A/V receiver to watch a movie. The shade motors run on battery power—standard D-cells—which makes installation much simpler. Lutron’s Battery Boost option uses an alkaline-balancing technology that the company says can increase battery life by up to 80 percent with roller shades that are 38 inches and wider. Lutron says you can expect a set of batteries to last as long as six years. The 12-foot shades rolled up very smoothly and quietly during the demo I saw at CEDIA, and a Lutron spokesperson told me that adjacent shades will track together and maintain perfect alignment as they move up and down a window. A fully rolled up 12-foot-by-12-foot shade is just three inches in diameter. Triathlon WIDR shades are available in a wide variety of fabric colors and textures, and are made to order in sizes ranging from 20.5 inches wide by 12 feet tall, to 12 feet wide by 12 feet tall. Prices start at $1065, plus $70 for the Battery Boost option. They are available now.